The “team” may have hit a few snags these past few weeks, but that doesn't mean that our unlikely gang of anti-superheroes are throwing in the towel. No, when the outside world gets too weird, the weird search for worlds inside, as in within the mind of one of the most shattered souls in Doom Manor—Crazy Jane. 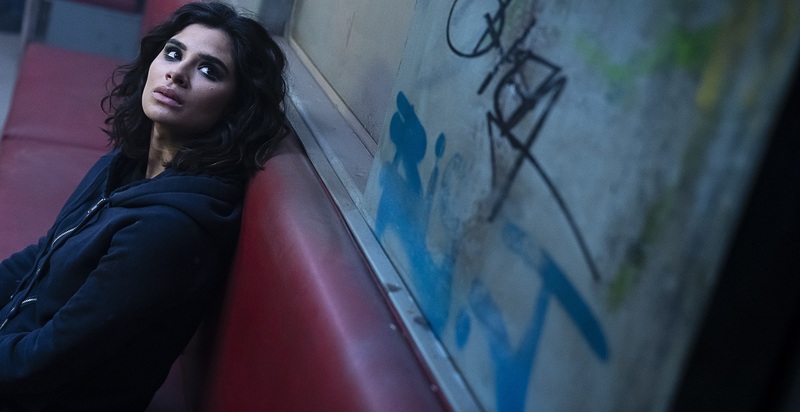 The latest episode of Doom Patrol, which is now up on DC Universe, is appropriately titled “Jane Patrol” and gives us the best look we’ve gotten so far at the enigmatic, and seemingly tragic, character played indelibly by Diane Guerrero. It's one of the episodes that Guerrero is most excited for fans to see because of how much it dives into her character's psychology and how Jane, along with all the other Doom Patrol members, can't be defined as all good or all bad. "It's just a wacky universe, right? It really just has no boundaries, which I tend to see in a lot of superhero shows where they have clear lines of good and bad," Guerrero explains. "There's black and white, there's not much gray area. That is what's wonderful about Doom Patrol. It embraces that gray area to the max, having characters that exist just to exist and they don't care to give you an explanation as to why they exist. It’s wonderful." When it comes to Jane and her 64 personalities, Guerrero relishes how she's allowed to explore why Jane suffers from dissociative identity disorder and how trauma can affect someone, albeit with much more heightened stakes in the comic book universe. "I love that it talks about the human condition," Guerrero says. "This show really questions the brain and human behavior and what trauma does to a person's brain and their development. I love those questions because I'm constantly asking myself those and I'm constantly asking the world those questions. They're not the easiest to answer." She smiles, and then adds, "And I just love how Doom Patrol just answers and doesn't answer unapologetically. I like these heroes’ reluctance to save the world. They're answering more existential questions rather than dealing with your everyday, 'This monster, like, blew up this building, so what do we do now?' It's more questions of, 'Why are we here and [what's] my value? Do I matter?'" Just like the rest of her costars, Guerrero prepared for Doom Patrol by reading all of Grant Morrison's comic book run. And because she has a background in political science and philosophy, she immediately gravitated towards the deeper themes in the source material. "I dusted off some of my books about the human condition,” she reveals. “I read When Rabbit Howls, which was what the Jane character is based off of—the patient study in When Rabbit Howls. That book really made me see what could happen to a person who was just trying to survive. That gave me a lot of energy because it just grounded everything in what I already felt strongly about, which was the lack of conversation or the lack of importance given on mental health and how we are often not believed when we say, 'I have a severe trauma that makes me behave a certain way and because I haven't addressed this, this is how that is informing me in my behavior.'" While all the characters are dealing with their own specific trauma and all of their physical, mental and emotional consequences, Jane's has evolved into splitting into 64 different personalities, each one incredibly different and with their own unique superpower. It’s a pretty hefty challenge for Guerrero, who is tasked with making each one unique and consistent from appearance to appearance. The physical changes that she brings to each personality, along with changing her voice and mannerisms, helps differentiate each one, and to keep each personality separate, she keeps a journal that she uses to track every single one. "Movement informs me a lot," Guerrero shares. "Ultimately, Jane is grounded, all these personalities are grounded, in one significant event—what happened to actually form all these personalities? It was this traumatic event that happened to Kay. We're all trying to protect that little girl, and we're all grounded in that. As long as that is real and present, then there's something to reference." She pauses, and then adds, "The personalities’ main trait or why they actually would come out in place of Jane, whether it is to run away or to fight or to keep harmony or to blow something up, every one comes out when they're needed. I worked a lot on movement and where the character or where the personality led from." Another tool she's been using to keep all the personalities in their own lanes is through music. "Music informs me a lot and each personality has their own soundtrack," Guerrero reveals. "It ranges from Metallica to Backstreet Boys. We all have so many different sides of us that come out [in response] to any particular challenge or any particular circumstance that we need to behave or be a certain way. This is being yourself, revealing all of your sides at all times. Some of us choose to contain that and are just one way all the time, and that can be exhausting. There's something so freeing about having all of those different personalities to access." She laughs, and then continues, "But Jane is pretty much sick and tired of it. She's annoyed that she always has to keep these assholes at bay. Some of them are just ruthless!" And that's why Jane is Guerrero's favorite personality to play on Doom Patrol. "She balances me," she reveals. "I'm like all of them somewhat, but I tend to be least like Jane, and I think that's why she's my favorite. She's the most tame and calm. She's always up for a challenge, but I think that there's a lot that she's thinking about all the time, and her way of doing things is to be neutral. I think I need a lot more of that in my life." At times, Jane has come off as tough, but Guerrero makes it clear that she’s much softer than her occasional bluster would suggest. "With Jane, you're going to realize that she's just really, really, really, really squishy and vulnerable inside despite her tough exterior," she says. "She constantly tries to push and shove in your face but she's very, very sensitive and has a lot of love to give." Even though playing Jane is helping to "balance" the actor in real life, she reveals with a sly grin that sometimes she falls back on the character as an excuse whenever she gets a little too fiery on set. She laughs again, and then adds, "Sometimes I’ll just want to kick things. And I'm just like, 'That's Jane! Sorry.' It's been actually really cathartic for me." Catch new episodes of Doom Patrol every Friday on DC Universe. Click here to subscribe now.